This shop has been compensated by #CollectiveBias, Inc. and its advertiser #AddCoolWhip . All opinions are mine alone. One week from today I will be getting ready to head back to work. (Can you tell I never want the summer to end?) And even though I am in denial, I am already planning ahead for my upcoming, hectic work schedule. Without fail, when I get home everyday around 4:00 I am always looking for an afternoon snack. During the summer I am able to take my time making something or I can always just head to the store since my days are pretty flexible. But during the school year, I need to have some quick and easy snacks around so that I can grab something to eat quickly before heading off to an evening meeting or running errands. Just like most people, I usually end up snacking on a granola bar, some apple slices or maybe some trail mix or cheese and crackers. But every now and then I am looking for something a little sweeter to snack on. And even though we will be back in school in August, the weather will still be in the high 80's and 90's most days, so a cool and refreshing sweet treat is exactly what I will be looking for. 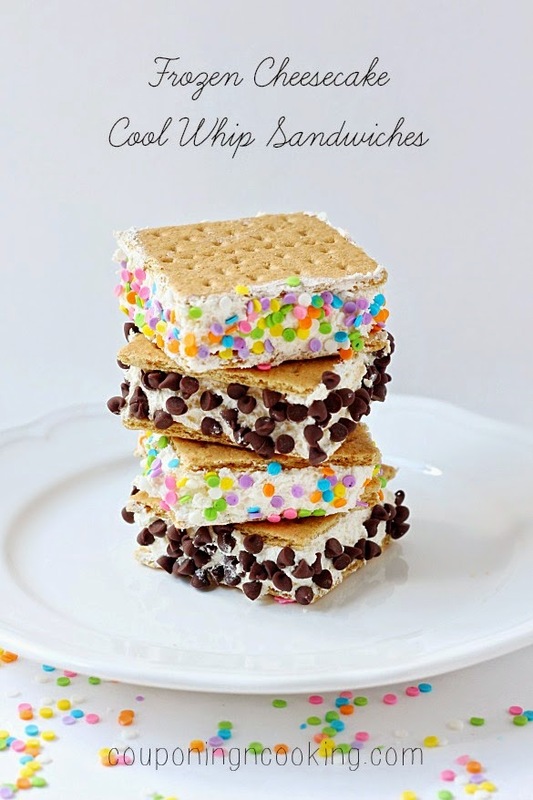 These Frozen Cheesecake Cool Whip Sandwiches are so easy to make a head of time and stick in the freezer for a single serving treat. 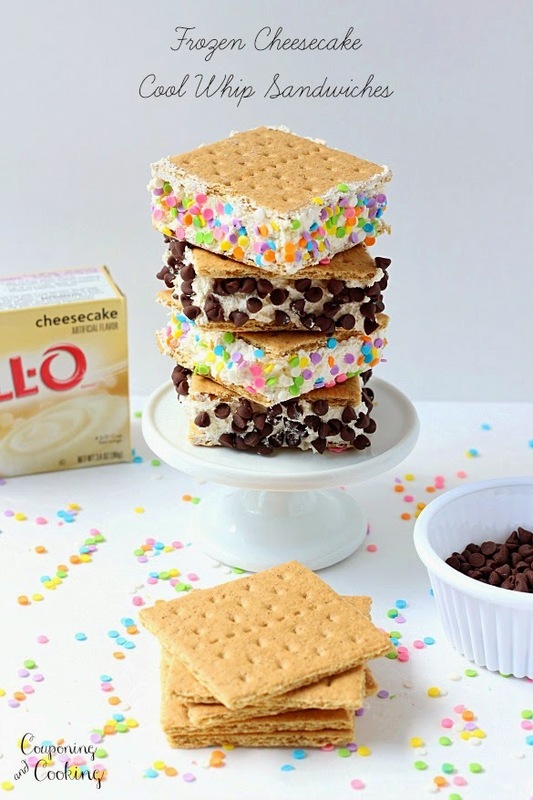 They only have three main ingredients: Cool Whip, Jell-O pudding mix, and graham crackers. What I really love is not only are they easy to make but they are easy to customize too. With all the different flavors of Jello-Pudding mix out there you could make a different flavor every week for the first few months of school. 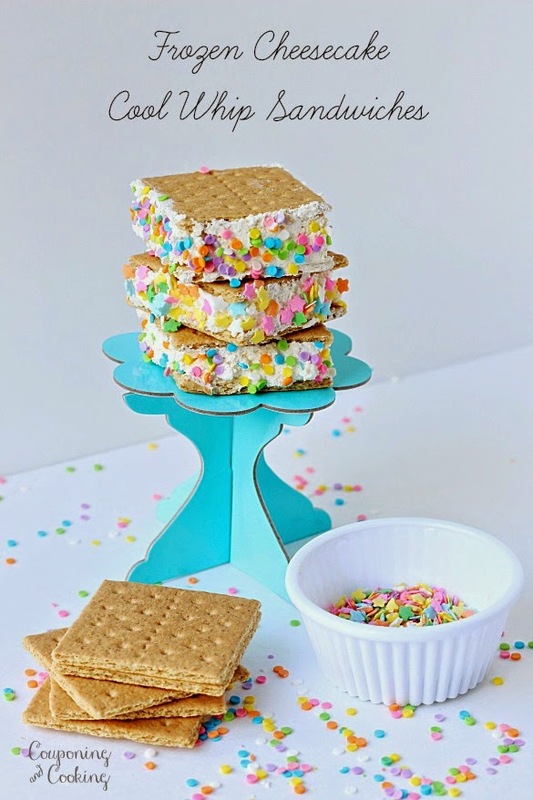 I jazzed mine up with some sprinkles and mini chocolate chips but you could also add chopped nuts, shredded coconut, toffee bits, or any other type of toppings you want. 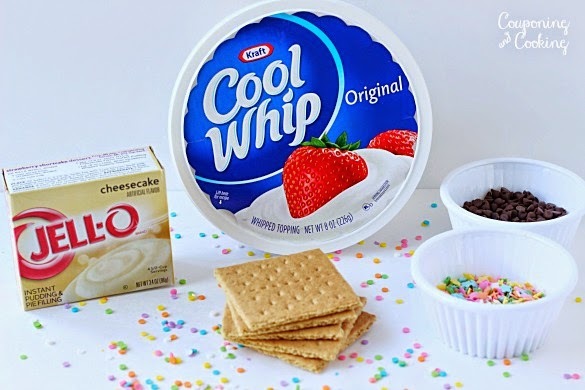 I went with the regular versions of Cool Whip and Jell-O but you can always go with a sugar free or lite version too depending on your personal needs and preferences. While we enjoyed most of these over the last week of sweltering hot Florida summer temperatures, I have a few stashed away in tupperware in the freezer for that first week of school. 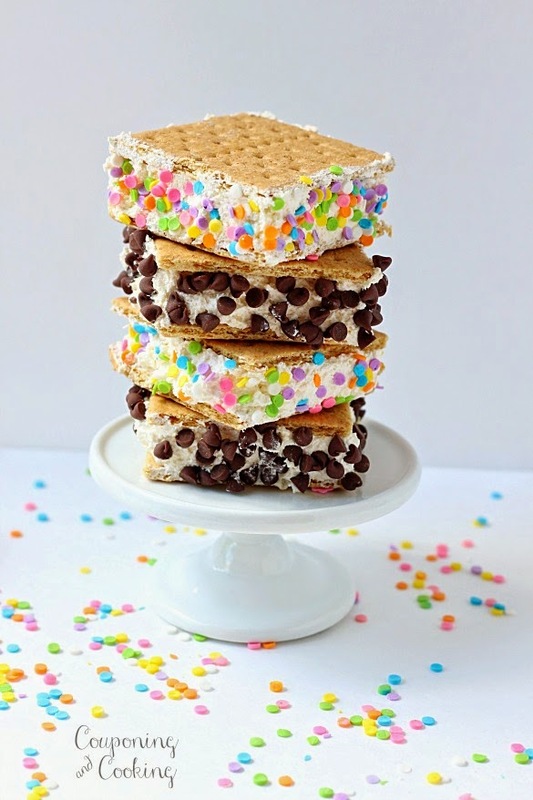 After a day of teaching with temperatures outside of 85+ degrees, I am really going to need to walk in the house, kick down the air conditioner, kick off my 5 inch heels (I am a glutton for punishment I know), and grab one of these frozen dreams to cool off and calm down. And after a few minutes of relaxing with my after school treat, then maybe I will have enough energy to re-organize our home office. Or maybe I will grade papers in my pj's and call it a day. 1.) In a large bowl, mix together Cool Whip and Jell-O pudding mix. Make sure that your Cool Whip is completely dethawed if you store it in the freezer or else it will be difficult to mix. 2.) 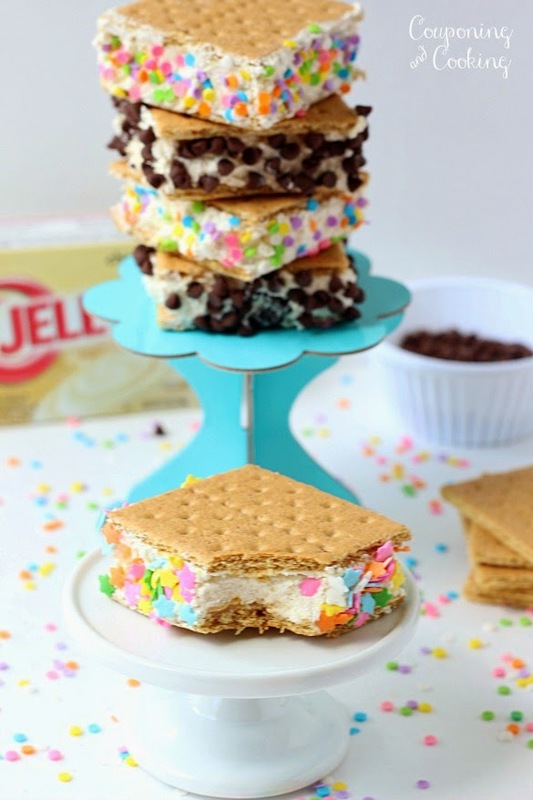 Using an ice cream scoop or a large spoon, place a scoop of the mixture on one graham cracker square and then sandwich with another square. 3.) If desired, sprinkle the sides with mini chocolate chips, sprinkles, chopped nuts or anything you like. 4.) Place in an airtight container and freeze for at least six hours before enjoying. 5.) Should be stored frozen in an air tight container or you could wrap them individually in cling wrap and freeze for easy single servings. I purchased my Cool Whip and Jell-O pudding mixes at Walmart and right now you can save $1 when you buy ONE (1) tub of COOL WHIP Topping (any size) and TWO (2) boxes of JELL-O Pudding Mix. Coupon is only available while supplies last so be sure and print it out today!